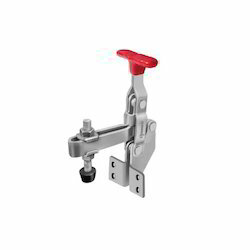 We are a leading Manufacturer of vertical handle toggle clamp, flange base toggle clamp, straight base tc-sb-v toggle clamp, straight base toggle clamps, side mounting toggle clamps and side mounting toggle clamp from Ahmedabad, India. 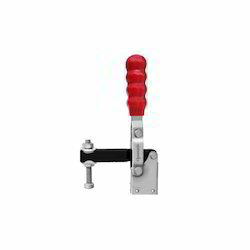 These TC-V Series Vertical Handle are high on durability and reliability. Our range is manufactured in accordance with the international standards using quality materials. 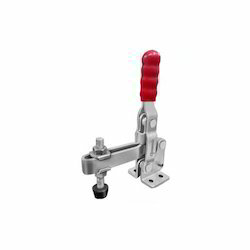 These are also offered in various specifications as per the clients’ requirements. They are checked on various parameters to deliver defect free range. 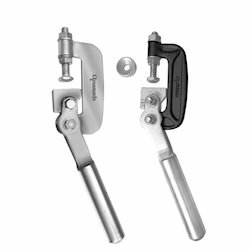 These clamps are the most popular type of Toggle Clamps, the arm & handle rotating in the same direction and high clamping forces being generated. 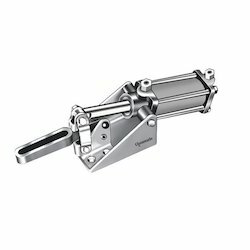 AS Series have a "U" bar arm which enable one or more spindle to be moved into any desired position along "U" arm. 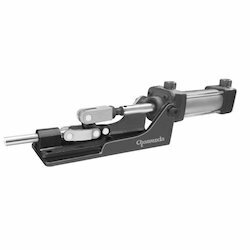 FS Series have a solid hold down bar which has a fixed guide bush at its and for spindle assembly. Zink passivated for corrosion resistance. 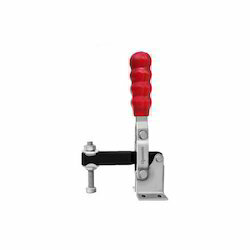 Coloured vinyl PVC grip for safety and comfort of operators hands. 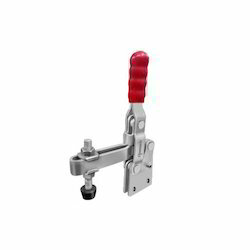 These series has an angle iron base for drilling and bolting into work position. Clamping arm section made from plate. Location of spindle assembly guide bush is Fixed at end of solid hold down arm section. 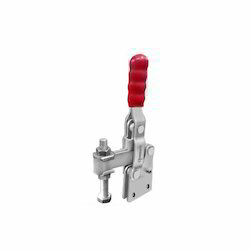 These Series is fast action, moderate clearance, positive holding. 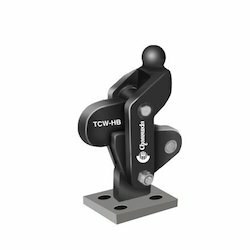 These models have a sturdy solidly bar base designed primarily for easy welding into work position. 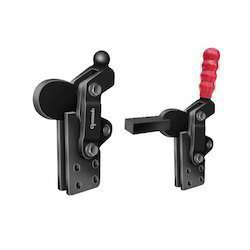 HB series ideal where mounting space is limited base can be drilled or welded. 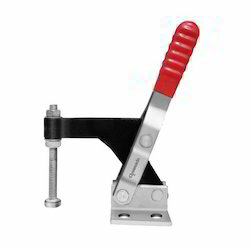 The Compact design makes these clamps excellence for heavy duty. 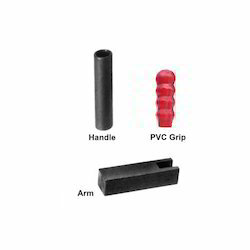 Hardness steel pins and bushings at pivots points make them durable. The base can be weld or drilled. 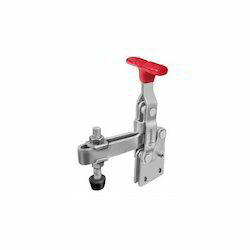 The handle is being supplied separately which can be welded as desired. 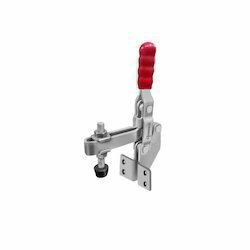 BS Series can be directly mounted or weld to a fixture or alternative to the accessory base for bolt mounting. 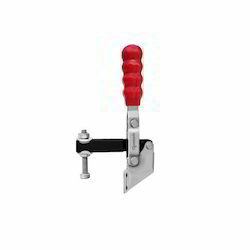 H-model Series have a low profiles to permit free overhead movement and where the action of the clamping arm and handle rotating opposite direction is more suitable. 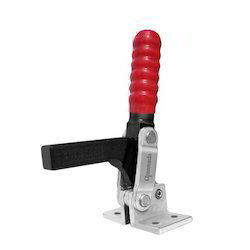 AS Series Equipped with "U"bar armed spindle to be moved into any desired position along with the "U" bar arm. 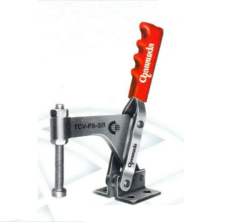 FS Series is similar to AS series except that holddown bar is solid and spindle assembly guide bush is fixed at the end of solid bar. 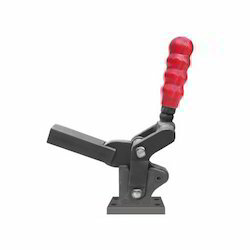 This clamp is unique in having an action similar to a wide-opening locking. 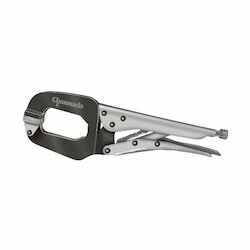 Plier, but having flange body can be fastened to the fixture or roto mold against which the work piece or mold half is to be clamped. 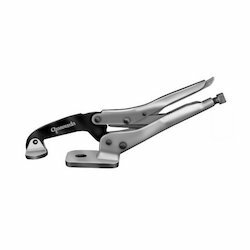 One hand operated clamps, so the other hand is free to position the to be clamped, hold two pieces together while marking off, template, welding, breezing, gluing soldering and assembly work etc. The pressures pad adjust parallelly to the work piece. 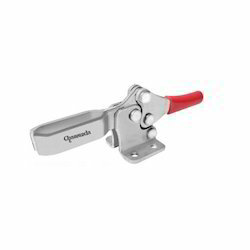 Adjust to proper opening with end screw and unlocked fast with easy release trigger. 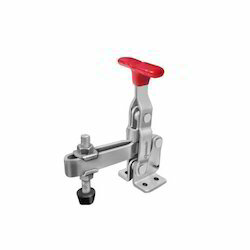 Straight line Action horizontal toggle clamp has 25 mm diameter plunger is drilled and tapped for M16 x 1.5 spindle Plunger travels 50 mm and moves into mechanical lock in the extended position. All cylinders are double Action. This model has a 12 mm dia. A plunger which is drilled and tapped for a M8 x 1.25 spindle. The plunger Travels 30 mm. and moves into a mechanical lock in the extended position. 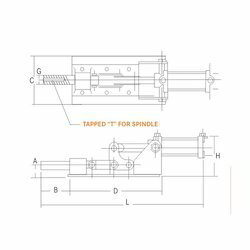 AS: It has a U-bar arm and flanged washers for easy lateral or vertical positioning of the spindle which canbe moved to any desired position along the "U" arm. 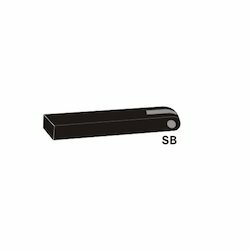 SB: It has a solid hold-down square bar arm which can be easily cut off, drilled and tapped for adjustment spindle of the welding of special adopters. All Hold-down arms opened at 900 All Air cylinder are double action. 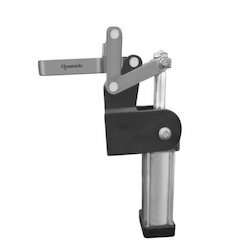 clamp has bar arm at right angle cylinder. It could be used where space dictates applications such as rotary indexing table and injection molding fixtures. 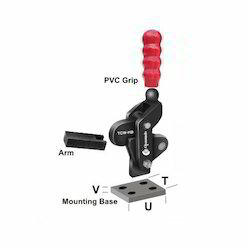 This model offers a particular advantage that is it could be mounted either on the side or top of the fixture. 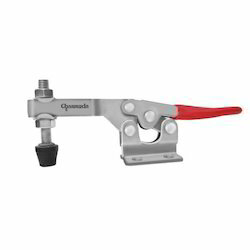 The clamp can also to be mounted with the cylinder horizontal in which the hold-down bar pulls back toward itself. 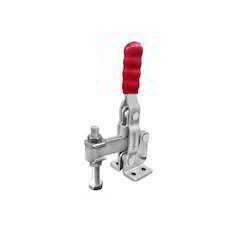 Double acting cylinder with built in speed controls for smooth operation. 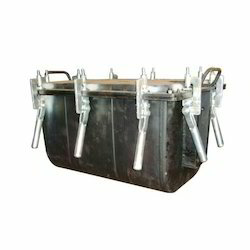 Bar arms opens full 90 degree for easy part loading and unloading. 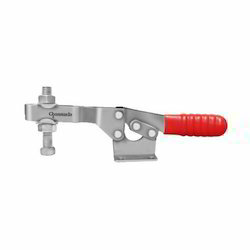 These models have sturdy solid bar base for welding into working position, and clamping arm section made from plate. Location of spindle assembly guide bush is fixed at end of solid hold arm section. 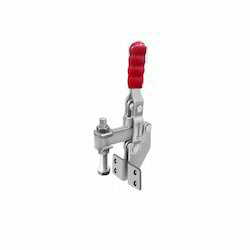 Looking for Vertical Handle Heavy Duty Toggle Clamp ?